Dryer parts eventually break down and need repair. The Kenmore dryer is no different. The first thing that needs to be done is to figure out where the problem is. Kenmore dryer troubleshooting will pinpoint where the fault is and then the correct part can be replaced. The do-it-yourself home owner will be able to troubleshoot a repair by considering some common dryer malfunctions. Always disconnect the power from the dryer before attempting to troubleshoot. 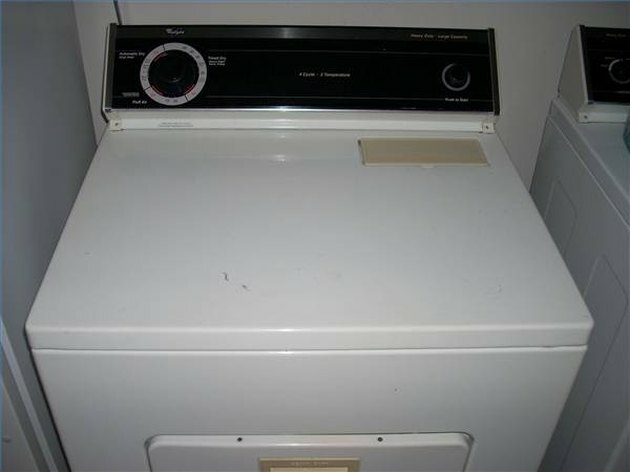 A Kenmore dryer that just does not run may have a faulty door switch. Open the dryer door and press and release the switch. It should click each time this is done. If it does not it needs to be replaced. Insert a putty knife between the front and top panel and press in on the retaining clip. Lift the top panel up and move it over so you can reach down to the switch. The switch may be clipped on or attached with screws. Remove it from the dryer door and disconnect the wire. Replace it with a new switch and reassemble the dryer. A Kenmore that runs but does not heat most likely has a faulty heat element. You will need to remove the top and front panel to access the heating element. Refer to your owner's manual for your particular model. When the heating element has been accessed, remove it from the dryer. Using a volt-ohm meter set on RX1; touch a probe to each of the terminals on the heating element. If there is a reading other than zero the heating element needs to be replaced. Damp clothes indicate poor air circulation. The moisture is not leaving through the exhaust vent, but rather recirculating in the dryer. Disconnect the dryer duct from the back of the dryer and the outside dryer vent. Clean the dryer duct, outside dryer vent and the dryer exhaust. If a dryers' ductwork runs inside a wall, you may have to snake it to clean it. Purchase a long-handled dryer vent brush and a roll of electrician's tape. From the lowest end of the ductwork, run the electrician's tape through to the other end. At the high end, attach the vent brush to the electrician's tape and insert it into the ductwork. Back at the low end, pull the tape slowly out of the ductwork bringing the brush and the lint out with it. Once all the parts are clean reattach the ductwork to the dryer and the outside vent.